This entry was posted in Gratitude, Random Musings by Becky Green Aaronson. Bookmark the permalink. Wish you and your family a happy new year, Becky. Enjoy your holidays!! Thank you, Arindam. Happy New Year to you as well! I hope 2014 has gotten off to a great start for you! Happy Holidays, Becky! I hope you and your family have a joyous holiday and a wonderful, bright new year. Hugs! Happy Holidays to you as well, Monica! I hope you revel in all the fun the season has to offer (and then some)! What wonderful words, Becky! Thank you for reminding us of all the good things this season brings. Wishing you and your family a very happy holiday and New Year! Happy Holidays to you and your family as well, Melissa! It’s so nice to hear from you. It’s been a long time. I hope all is well with you!! So happy and grateful that the wizardry of the Internet brought you into my life. Merry Christmas, my friend. Ditto to that, Jayne! I’m so happy to call you my friend. Enjoy the holidays! 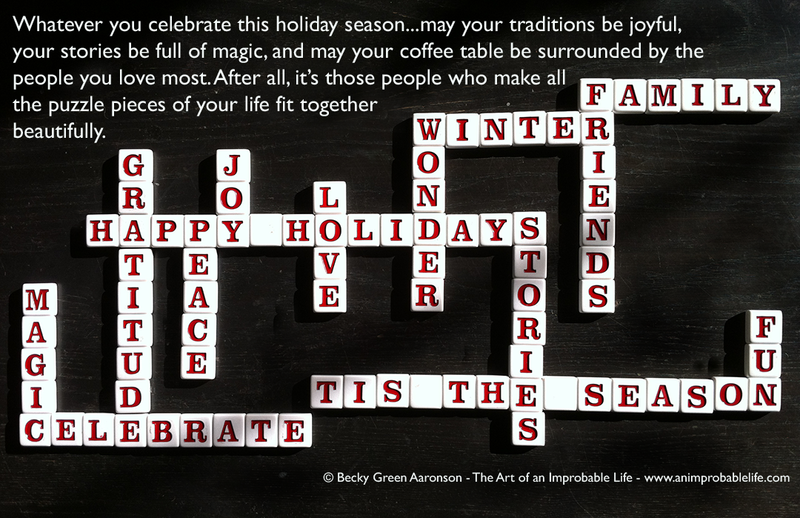 I LOVE crossword puzzles and what a fun way to wish everyone a wonderful season, no matter how they celebrate! I just heard today is the 100th anniversary of the crossword puzzle. How appropriate! Lovely graphic and thoughts, Becky! I hope you and your family enjoy a joyful and peaceful holiday season.